Dignitaries prepare to shovel gravel during a groundbreaking for terminal expansion Tuesday at Joslin Field, Magic Valley Regional Airport near Twin Falls. Mandie Lassiter, 3, eats cake while attending a groundbreaking for terminal expansion Tuesday at Joslin Field, Magic Valley Regional Airport near Twin Falls. 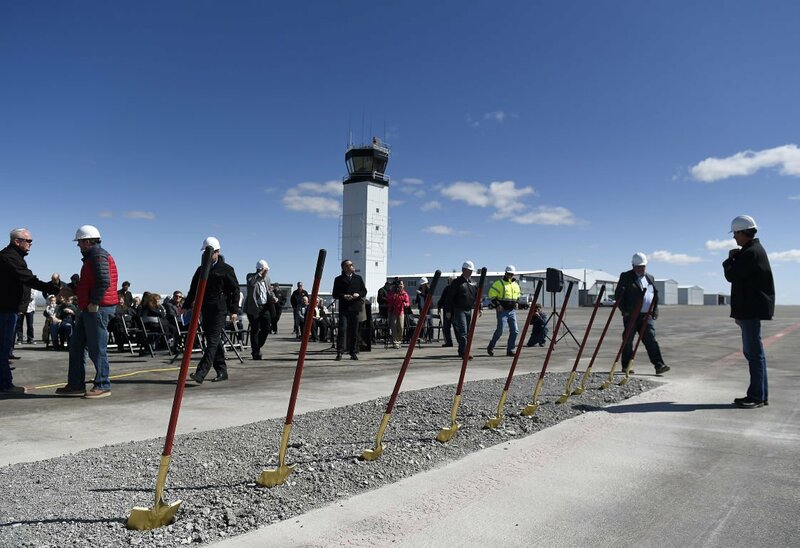 A commercial flight prepares for takeoff while the public attends a groundbreaking ceremony for terminal expansion Tuesday at Joslin Field, Magic Valley Regional Airport near Twin Falls. TWIN FALLS • Work is about to start on a $4.3 million expansion of the terminal at Joslin Field, Magic Valley Regional Airport. Airport officials and board members, city and county officials and the contractors on the project gathered outside the current terminal on Tuesday to ceremonially break ground on the project. “Primarily, it clears up congestion in the ticket lobby and the hold room area by creating space for passenger screening and baggage screening,” Martin Hahle, architect for CSHQA, the company that designed the terminal addition, said of the project. Hahle said airport passengers will see contractors in the terminal over the next month or so, but once the main construction starts, the work won’t be too visible. “Airport operations will be maintained 100 percent with really no impact to the airlines or the traveling public,” he said. The bulk of construction is expected to be done around Thanksgiving, with the final two phases of the project wrapping up in early 2017. The airport has three flights a day to and from Salt Lake City. In the winter it often takes flights that are diverted from Sun Valley because of bad weather. When the upgrades are done, there will be more room for security screenings, including a new security room and space for two lines instead of one. And, the area where passengers will wait after going through security will include concessions and a bathroom, neither of which it has now. “We’re excited for all the changes that are coming to Magic Valley Regional Airport and the benefits they will provide and bring to our customers,” said McKinnley Matson, corporate communications coordinator with SkyWest, which has served the airport since 1983. The city and county are splitting $179,000 of the cost, with the Federal Aviation Administration covering the rest. County commissioner George Urie, who has been the county’s liaison to the Airport Advisory Board for the past 10 years, said the upgrades have been discussed for years. “I’m happy to see that finally the timing and the funding all came together so we could make this change,” he said.